Read more from Washington and Lee’s feature article on Beth’s editorship. Comics editor Chris Gavaler talks with Mita Mahato about in-between areas, complicating responses, bored gratification, and the exuberance she feels when making art. Chris Gavaler: Unlike the majority of literary and artistic forms, comics does not have a single definition or set of requisite qualities, and so not all viewers will agree whether a given work is or is not a comic. Happily, your “Lullaby” falls into the exciting, contested, in-between area. Many of the conventions most associated with comics are absent: speech balloons, panels, gutters, even identifiably repeating characters. Shenandoah is publishing it as a comic—the first ever published by the magazine—but what do you consider “Lullaby”? 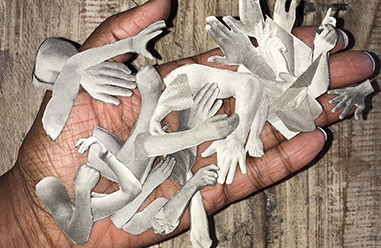 Mita Mahato: Working with layers of paper to construct my images means that I experiment with the comics medium in different ways than artists who work with ink. The vocabulary is similar, though. During the creative process, I’m usually thinking about panels and gutters—areas for content and areas for visual lacunae. If you look closely at “Lullaby,” you might identify images that operate as panels—like the rectangles and other shapes that represent sea and land. If we do approach these shapes as panels, then we might consider how the gutters between them function. Do they encourage readers to imagine narrative bridges, or do they suggest spatial barriers? Another way that the comics medium inspires my work is in its use of dissonant forms of signification. In most comics, that dissonance comes through the interplay of word and image. In “Lullaby,” I tried to invite it by playing with different visual signifiers—for example, the photographic hands and the more abstract, cut-paper imagery. That is all to say that the creative process that went into “Lullaby” is indebted to the comics medium, and I’d consider it a comic. Readers might think differently—and I welcome those complicating responses. 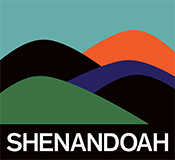 I think it’s pretty wonderful that Shenandoah is providing a platform for artists and readers alike to explore the expansive possibilities of the comics medium. And I’m thrilled that “Lullaby” will be part of that conversation. Chris Gavaler: Comics were traditionally drawn on paper, first in pencil, then finished in black ink, with color added during the printing process. We understand your process is very different. Can you give us a sense of how you work? Mita Mahato: My process can take a few different paths, but more often than not, I start with pencil on paper, too. Most of the visual elements you see in my work began with a sketch that served as the basis for the cut-paper images. Once I draw a “template,” I use it as a guide for cutting paper shapes that I paste together to form the final image (think of a how a sewing pattern works). Sometimes, the cutting is more instinctive than methodical—like the waves or crop rows in “Lullaby” (which were done without a template) or when I use traditional collage technique. Once a page is done, I scan it, complete any needed cleanup in Photoshop, and then print it. Because I work in layers, the scanning process retains shadow lines, which is what makes one-dimensional images appear to have texture and tooth. Chris Gavaler: “Lullaby” is also a wordless comic. Some of your other works include words, either as narration or as speech in semi-traditional balloons, but in “Lullaby” you leave the non-narrative imagery to do all of the work. But there is a sequence, a kind of logical or at least intuitively evocative progression. Did you have a traditional story in mind? And however you began, why were words the wrong means to express it? Mita Mahato: I had the title in mind pretty early on and it might provide a way into answering these questions. A lullaby, of course, is a song that aims to put one to rest, sometimes (as in “Rock-a-bye Baby”) slipping into dirge territory and threatening ultimate rest. The images that sing the dark song of this lullaby were inspired by the plight of the southern resident killer whales, which are endemic to the Puget Sound region where I live. Human activities, especially those related to river management and chemical pollution, have brought the population of this unique culture of whales down to fewer than eighty individuals. Because the song that “Lullaby” sings is about humanity’s undeniable role in species extinction, I wanted to draw attention to collective actions over individual voices. I wanted to spoil the consumer’s daydream of quiet seasides. I wanted to expose that the lullaby we are singing to these whales is a deadly hum made up of pleasures and habits that have become so everyday to us that we don’t register their impact outside of our own, bored gratification. The absence of words gave me space to orchestrate a visual clatter; I wanted the pages to be loud with the invention, industry, and perspective of free enterprise. Even when we aren’t speaking, our presence is constant, crass, deafening. Chris Gavaler: “Lullaby” is both intensely sad but also incredibly beautiful. How do you see those two emotions—delight and sadness—working together in your work? Mita Mahato: I think that any emotion that my art elicits is probably shaped by the very strong feelings that I have about the fundamental and insistent relationship between form and content. Because I gravitate toward themes of loss, I tend to use old, discarded newspaper, magazines, packing tissue, maps, etc. to create the images in my work. Commingling with this generally mournful content, however, is the exuberance I feel in the process. There is something so joyful about taking old paper that is bound for the recycling bin, or paper that is designed for a purpose that is no longer in play, and transforming it for new use. What you may be seeing in “Lullaby” is this dual action that I bring to my work—to grieve and to create. In “Lullaby,” all the cut-paper elements (the sea panels, the whales, the boats, the hands, etc.) are made from the color patches in newsprint advertisements or the grayscale images of photojournalism. I like that the resulting images materialize both bereavement and jubilation in their exhibition of new imagery born out of cut and pasted remains. Loss does not always entail transformation, but art made in response to it might at least encourage some pause and some reflection. 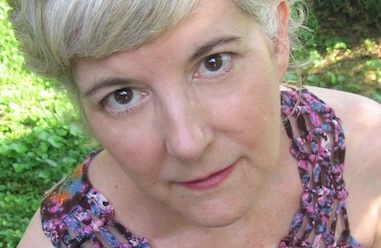 Poetry editor Lesley Wheeler talks to Janet McAdams about indigenous poetry, middle age, discovering translating, and micro-reviews for the Kenyon Review. Lesley Wheeler: What has changed in the publication and reception of indigenous poetry since I interviewed you in 2005? Natalie Diaz just won a MacArthur grant, and Poetry recently featured a Native Poets folio edited by Heid E. Erdrich, but the Earthworks Series you and I discussed was short-lived. My own sense is that in the U.S., more voices are getting into print, but I wonder to what extent that’s a side effect of receiving the review books you pick out for me for the Kenyon Review Online. Janet McAdams: The Earthworks Series ran for ten years, although to be sure in the last few years most of the titles were translations, rather than Indigenous poetry. Salt, like many independent presses, struggled after the economy’s downturn, and distribution became so difficult we no longer felt it was possible to disseminate the books as they should be. I am grateful to the poets who entrusted me with their books, and we published some extraordinary works, titles by LeAnne Howe, Gordon Henry, Heid Erdrich, Diane Glancy, Kim Blaeser, Deborah Miranda, Carter Revard, James Thomas Stevens, Allison Adele Hedge Coke, Cheryl Savageau—to name a few. And Allison edited the two Effigies anthologies of chapbooks by emerging Indigenous authors, many of whom are now vital participants in the new generation of Indigenous poetry. But to speak more specifically to your question about the landscape of U.S. poetry, I believe the micro-reviews I edit for the Kenyon Review reflect what’s really going on out there. Who ever expected this, this wild and rich flourishing of so many different poetries, different, yes, in all the ways people intend when they trundle out that tired rubric diverse. I’d say inclusive but that, too, is a problematic term, one that presupposes a center opening up. Instead, I’d say the finally and rightfully besieged center is now so displaced, one might hope it could actually disappear. I don’t mean to dismiss the institutional powers that yet privilege white and wealthy and straight and male writers. Creative writing programs have long been bastions of New Critical values and are thus complected, and TPTB continue and will continue, until someone stops them, to hire people who look and think just as they themselves do. But who are the poets being read and discussed by this generation of readers? And what kinds of formal practices and possibilities are now on the table? It’s an amazing time for poetry and I hope the micro-reviews reflect that. Lesley Wheeler: Your poems in the current issue of Shenandoah are from a new collection in progress, Out Late. It’s partly about middle age, a subject I’m obsessed with. Will you tell us about the project? Janet McAdams:Well, middle age is such a curious rubric, isn’t it? It seems to suggest a threshold, the space between one life and another, but culturally it’s figured as anything but. There’s a lateness to middle age and I’m curious about that quality of the late, belatedness, and, especially, lateness, as trope, lens, shift in register. The twinned, paradoxical notions of too late and of the glowing urgency lateness foists upon us. We pretend that time is/was already always there and that it is scalable, but in fact it’s something largely made up, and it claims what space it can. I’m interested in lateness not as a time period but as a temporality. Carolyn Forché has that marvelous poem “Selective Service” in The Country Between Us in which time is constructed by a particular historical moment. “In what time do we live,” her speaker asks, “that it is too late / to have children?” That line has haunted me for years. In what time(s) do we live now when it is too late to recover all my generation fought not to lose? Are we out too late? Did we stay out too late? So in the collection—so far, anyway—are poems concretely about certain losses, about coming out, about coming out late, about staying out late. I want to put into conversation the very different lateness of when I was younger, the late-night culture of my twenties and early thirties, with the lateness that haunts me these days, not only in relation to my own life and choices that may be closed off or closing off as I age. But lateness as an historical moment, a condition even. I wrote about environmental apocalypse in my first book in ways that were angry, fearful, and in ways that imagined a world that might come. Now, that next world seems at hand, as much a condition of affect as melting polar caps or a Texas-sized island of plastic in the Pacific. And it is the nature of that affect I want to try to grasp, to document. LW: You’ve also been publishing translations. What attracts you to the practice and how is it affecting your other writing? Discovering translation has been one of the great joys of my writing life. I am fortunate to have been mentored by a superb translator and teacher of translation, Katherine M. Hedeen, who convinced me of its importance. The statistics are staggering—3 percent of all titles published in the United States are books in translation. They speak to the worst aspects of our solipsism as a literary culture. The website Three Percent reports that of that total, the 3 percent of all books published in the United States, really only 0.7 percent are poetry or literary fiction. Translation is a political act, an act of service. But I will say that although I began thinking of good literary citizenship, the pleasure of the work has surprised me. How much it is like writing a poem. How little it is like writing a poem. How one’s ego hovers and sometimes needs to be slapped out of the room. It was a long apprenticeship. I am not one of those people to whom second languages come easily. So I had to, over the course of a number of years, regain the Spanish I’d lost, then learn a whole lot more. I audited Kate’s class on translation, and I studied translations, good and bad. And I’ve only just begun to publish some of this work. 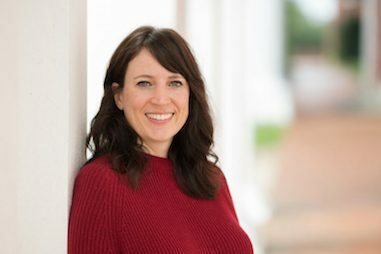 Lesley Wheeler: I’ve also appreciated your commitment to curating reviews at the Kenyon Review Online, with an eye toward presses and projects that don’t always see a ton of attention. That’s a lot of work for a poet-teacher-scholar-editor who already has so many irons in the fire. How do you approach reviewing and why do you think it remains worthwhile? Janet McAdams:I think one reason I started the Kenyon Review’s new series of micro-reviews was entirely selfish. I wanted firm deadlines to do something I was having trouble doing, in the midst of the teaching, writing, and editing you mention: finding time to read contemporary poetry deeply and carefully was difficult. That said, there are profound problems in the economy of poetry reviewing in the United States. A hard look at who and what gets reviewed—and by whom and where—really distills the current conversation about privilege and prejudice, a conversation that VIDA: Women in the Literary Arts has worked hard to keep lively and influential. It’s easy when you’re young to think that all or almost all that matters is getting your book accepted for publication. But extraordinary books of poetry get disappeared all the time and for all sorts of reasons. Given the pluralism of this moment in U.S. poetry, reviewers should do more than old-style vetting from a list of important titles. Surely it is also the job of the reviewer, if not their chief job, to ferret out work that compels them and make the case to their reader of the work’s importance. Tell me about that book I might have missed, those poems that deserve to be read and that I deserve to read.